BEIJING– China’s economic expansion languished to its slowest pace in nearly three decades last year, as a bruising trade fight with the U.S. exacerbated weakness in the world’s second-largest economy. The 6.6% growth rate for 2018 reported Monday is the slowest annual pace that China has recorded since 1990. The economic downturn, which has been sharper than Beijing expected, deepened in the final months of 2018, with fourth quarter growth rising 6.4% from a year earlier. Adding to the gloom was the trade conflict with Washington. The uncertain outlook for Chinese exporters caused companies to delay investing and hiring and in some cases even to resort to layoffs–a practice that is often discouraged by China’s stability-obsessed Communist Party rulers. The official jobless rate ticked up to 4.9% last month from 4.8% in November. In the southern technology and export-manufacturing center of Shenzhen, for instance, many private makers of electronics, textiles and auto parts furloughed workers more than two months before the Lunar New Year holiday, which begins in February, according to business owners and local officials. The neighboring city of Guangzhou saw growth slump to 6.5% last year–well short of the 7.5% annual target set by the city government–as trade tensions hit the city’s manufacturing sector hard. 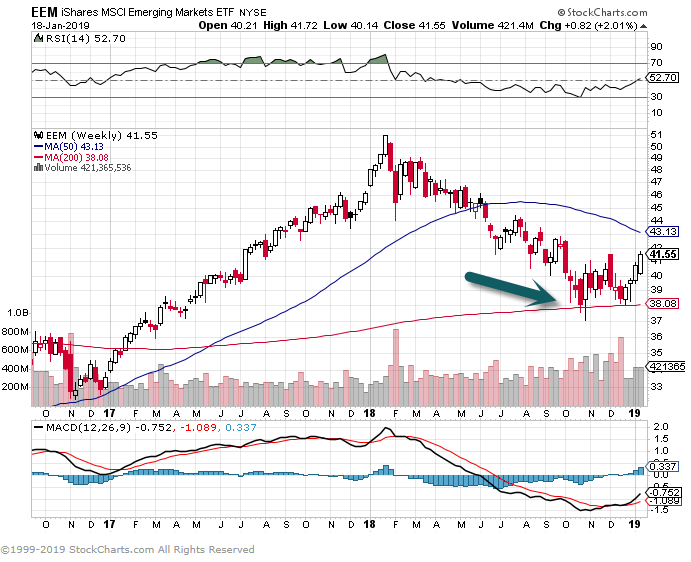 EEM-Emerging Markets ETF traded to 200day twice and held on long-term weekly chart. 2.The Question of 2019…Is China Growth Bottoming? 2019 continues to track the complete opposite of what we saw in Q4 2018, with the hardest hit areas during Q4 bouncing the most off of their lows this year. Smallcaps are leading the way with gains of nearly 10% on the year, while Energy (XLE) leads all sectors at +11.32% on the back of oil’s (USO) 17% surge. 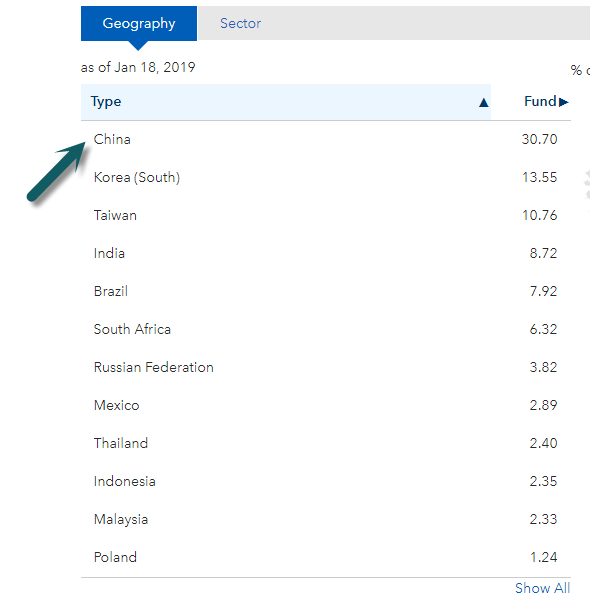 Brazil (EWZ) leads all countries in our ETF matrix with a YTD gain of 13%, which is a rare continuation of what we saw for Brazil to end 2018. Canada (EWC) is also posting a solid showing in 2019 with a double-digit percentage gain already. 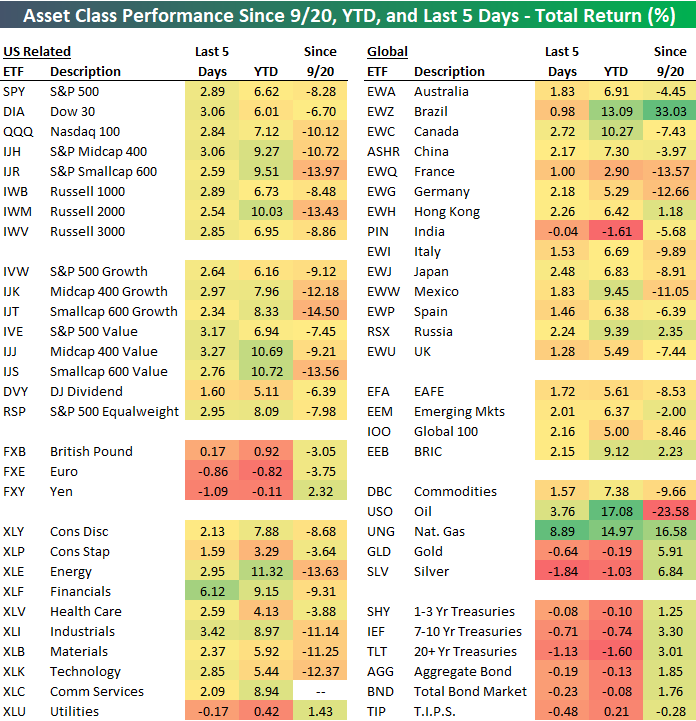 The only areas of weakness are India (PIN), precious metals, and Treasuries. For in-depth analysis of recent price action, sector technicals, earnings season, the economy, and more, start a two-week free trial to one of our three membership levels and read this week’s Bespoke Report newsletter. You won’t be disappointed! 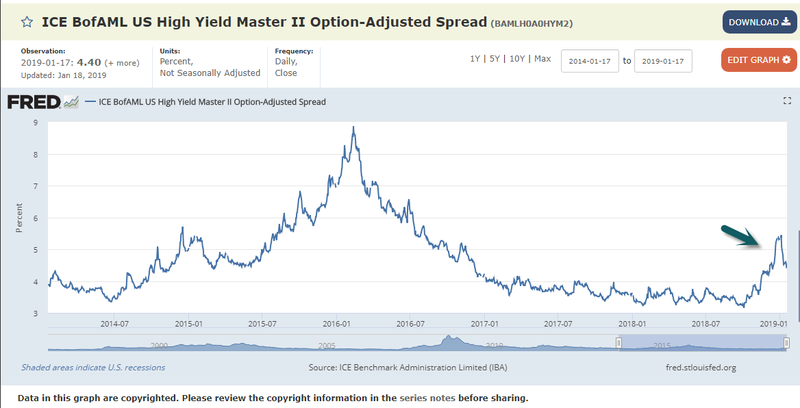 4.High Yield Spreads Roll Back Over. After spike up at end of 2018…spread roll back over. Actively Managed ETFs Still Less Than 2% of Business. 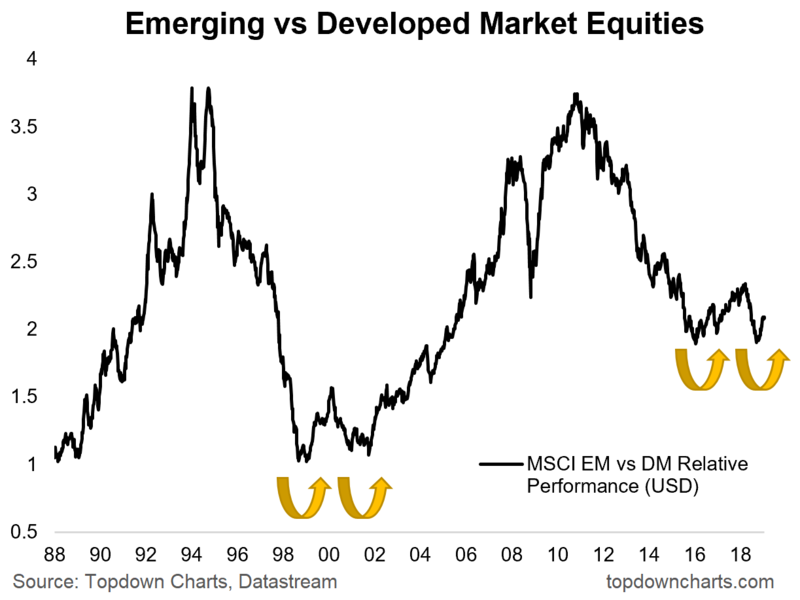 6.One Month Ago Close to Bottom…Market was at “Max Fear”…. Markets bottom on emotional max fear. 7.Personal Savings Rate Still Hanging Above 20 Year Average. 8.How the Energy Industry has Changed….Saudis Investing in U.S. Energy. Saudi Arabia is nearing a deal to invest in U.S. liquefied natural gas, a landmark decision for the kingdom, which in the past had been a huge supplier of energy to America. Saudi Arabian Oil Co., known as Aramco, has narrowed its focus to a shortlist of at least four U.S. LNG projects and intends to announce a deal in the first half of this year, people familiar with the matter said. Companies with projects being considered include Tellurian Inc., a Houston-based LNG developer known for its intention to ship gas from its planned Driftwood terminal in Louisiana, the people said. In addition, San Diego-based Sempra Energy, which is developing five LNG projects between the U.S. and Mexico, has had discussions with Aramco concerning its Port Arthur project in Texas, the people said. Aramco is considering equity stakes in the projects, the people added. It wasn’t clear what the value of the potential investments was. Any such investment would mark a sea change in the energy flows between the U.S. and Saudi Arabia. America’s shale revolution has broken years of dependence on Middle Eastern oil, to the extent that the International Energy Agency expects the U.S. to become a net energy exporter by 2023. For Saudi Arabia, the interest in U.S. LNG is twofold, said Jason Feer, head of business intelligence at New York-based consulting firm Poten & Partners. Energy majors including Royal Dutch Shell PLC, Total SA and BP PLC have already pivoted toward cleaner-burning natural gas, in a shift from their traditional oil businesses. Aramco doesn’t produce any oil and gas abroad, and while Saudi Arabia’s own gas reserves are some of the largest in the world, they are hard to extract and high in sulfur, making them cost more to process. Nearly all of the kingdom’s electricity is powered by oil or natural gas, but there are plans to diversify that into more natural gas and renewables, in part to allow more crude to be exported. A study published last year by Saudi Arabia’s government-funded think tank, King Abdullah Petroleum Studies and Research Center, found that shifting from oil to natural gas power generation had a positive impact on the economy, even if the gas was imported. Saudi Arabia said in October that it is considering investing in a stake in Russian energy giant PAO Novatek’s Arctic LNG 2 project, although no deal has been formalized. Aramco intends to make LNG investments in both the U.S. and Russia, the people familiar with the matter said. “By also investing in Russia they’re giving themselves options, trying to demonstrate that the Kingdom is trying to hedge against over-dependence on the U.S.,” said Mr. Feer. —Ben Dummett contributed to this article. 9.The Law of Unintended Consequences Alive and Well…Wealth Northeasterners Head South. 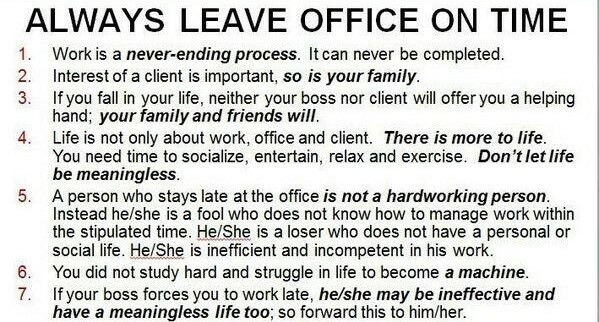 10.Always Leave Office on Time? I recently shared an image and comment on why I genuinely believe that we all need to practice the art of leaving the office on time. Admittedly I did not expect the 3k’s worth of likes and 100’s of comments however I wanted to share why I genuinely believe that to achieve the high’s of both professional and personal life you absolutely need to pay attention and ‘leave the office on time’. Interest of a client is important, so is your family– Honestly I scoff at the remark from those who think 2 hours in the evening is enough for your family, it’s really not. They will always enrich your life more than a client ever can, give them the time they deserve. If your boss forces you to work late– You know what I am a boss. If I have to ask anyone to work late or work late myself I am a fool. To date, I have never asked anyone to work late, I never will. Practice what you preach.